Hi there! This is my first ever post on this blog and also my first ever written book review – how exciting! So, let’s get started! 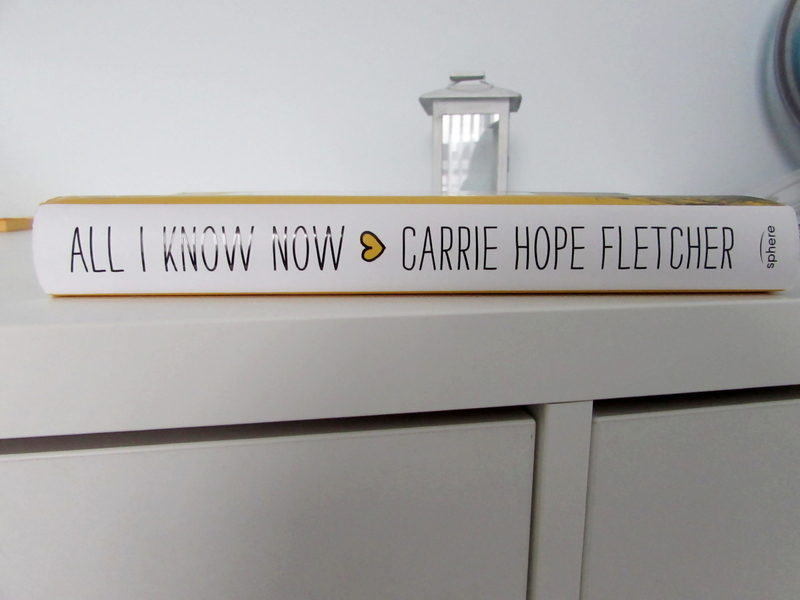 I’ll start off by saying that I was VERY excited about the release of this book, having watched Carrie’s youtube videos for over a year and gaining inspiration and wisdom from them along the way I had often wished for her advice to be in some physical format that I could reach for. 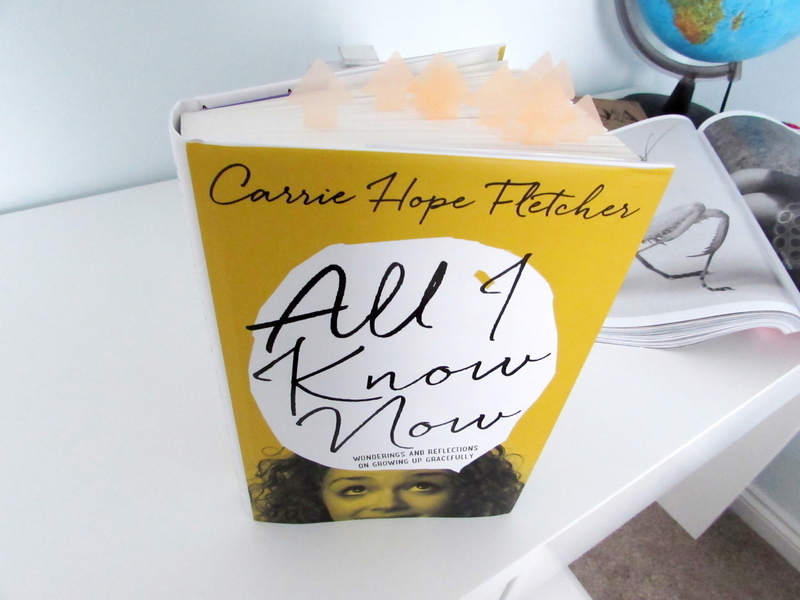 Therefore it’s needless to say that I was thrilled upon hearing of the release of All I Know Now, and swept up in Carrie’s palpable excitement about everything from the writing process to the book tour planned following the release. So I pre-ordered the book and finally got round to reading it about a week after the release date. And I was not disappointed! 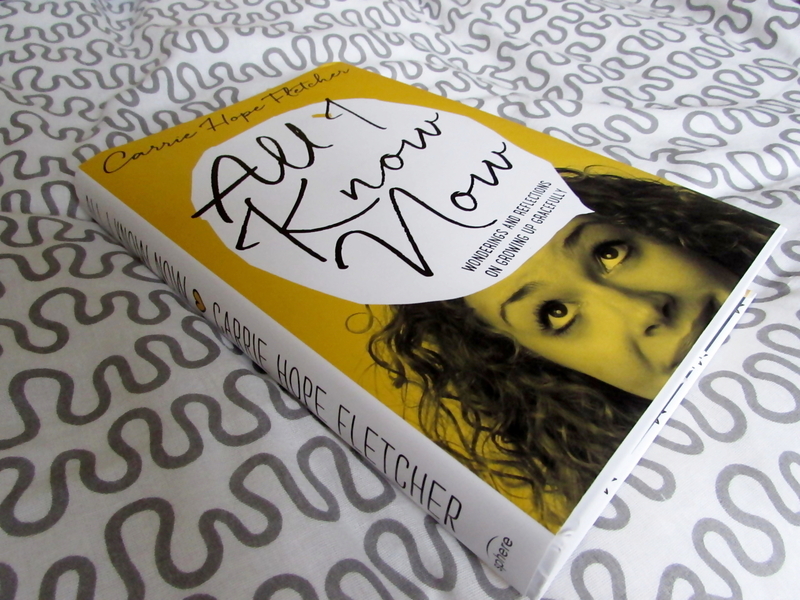 The format of the book is set out like that of a theatre show, an ode to another key aspect of Carrie’s career as an actress in the West End, with various acts and the help section at the end being labelled as ‘Props’. I found this aspect of the book to be very clever and fun, also making it easy to navigate were you to want to read about a specific topic. The Acts and the chapters within them covered a wide range of topics that were both interesting and helpful covering issues such as ‘How to Apologise’ and ‘The Past and Making Peace with It’. My personal favourite chapter was number 46; ‘Ripples’ which talked about the importance of small acts of kindness and how they can go on to inspire similar kind doings in others. The writing style was warm and witty, much like Carrie in her videos, such was the likeness in fact that I could almost hear her saying the words in her usual charismatic manner as I read along which only made the experience more enjoyable. As you can see from the picture above, there were many points in the book that I knew I would want to return to in the future was I ever in search of some damn good advice or some Carrie wisdom. Some of the highlights, for me personally, were when Carrie shared stories that were both heart-warming, side- splittingly funny and always relatable (apart from the one with the bear of course!). At many times during these dips into her past I found myself smiling from ear to ear and laughing out loud almost as if I was hearing these stories from a best friend or big sister. My only qualm with this book is there were times when I was gaining so much from a chapter or I was so interested in what she had to say on a particular topic that at the end I was left wanting more, however, I have no doubt that there is more to come from this show-stopping young woman. To summarise, this is a big sister in a book!